I've been playing a lot of XCOM: Enemy Within lately and marveling at its use of acronyms. There's MELD, EXALT, and MECs, not to mention XCOM itself. Beyond its frighteningly efficient use of letters, Firaxis has somehow managed to do the impossible - pack more of the same turn-based gameplay we loved about the reboot and add enough fresh new options to make you enjoy the alien-snuffing campaign over again. To recap our interviews and previews so far, Enemy Within is a moderately priced expansion - preorder on sale now for $26.99 - which adds all the features described below to the missions, plot, and gameplay of the original on the PC, while on the consoles, it's a standalone expansion which you can buy as a separate disc, but that also includes all of the missions, plot, and gameplay of the original XCOM: Enemy Unknown in addition to the new stuff in the campaign. Enemy Within comes out on November 12th, and adds strategic wrinkles and tactical options to the ongoing campaign against the invading aliens such as a new items, a third faction of human enemies called EXALT and an alien resource called MELD. Firaxis was kind enough to let me play the first half of the campaign with a preview code this past week, and I got to experience all of the new features within the context of how you'd actually play the game. 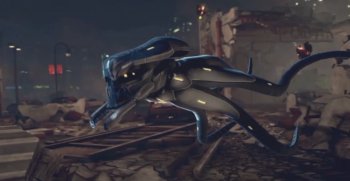 I am happy to say EW makes XCOM 78 percent better. The biggest overall change is the need to collect a resource on the tactical map itself. MELD is introduced in the second mission of Enemy Within, and it's a very good idea to make recovering the canisters a priority for your team. Excluding special Council missions or covert ops, alien encounters will begin with two canisters on the tactical map, each containing 10 units of MELD. There's generally one canister close to the starting zone that will expire in 4 or 5 turns, and one farther away you must grab within 10 turns. To collect MELD, one of your team needs to be adjacent to the canister - which really just looks like a yellow pillar jutting out of the ground - and you left-click to activate it. Doing so doesn't cost an action, but you can't pick up MELD if you have used both your actions that turn. Grabbing MELD is a fun secondary objective to murdering aliens, but it's pretty easy to do both on normal difficulty. Through the first half of the EW campaign I played on normal, I only failed to collect one available MELD canister. Of course, I also found myself delaying killing the last alien to make sure I had all the MELD, and that led to few fatalities. My apologies to Squaddie Robinson, but you had to die to ensure the success of XCOM and provide your commander with fancy new toys. What can you do with MELD? Well, it has two main uses. You can follow Dr. Chen's advice and use it to augment your soldiers with cybernetic implants or listen to Dr. Vahlen and graft genetic modifications onto your soldiers' DNA. The Mechanized Exoskeleton Cybersuit is actually a two part process begun by Dr. Chen in engineering. First, you have to "augment" your soldier by removing his or her limbs and replacing them with cybernetic versions. Then you have to build a MEC, and equip it onto your now-augmented soldier in the loadout interface. MECs can't use items or conventional weapons, but you can equip each suit with useful modules. Your first choice is between a flamethrower that damages units in a cone or a kinetic strike that deals 12 damage to an adjacent enemy, and the next is between a grenade launcher or a healing mist spray. As your cybernetic soldier gains ranks, you can also choose between tactical benefits just like you did with the classes in Enemy Unknown. In that way, you'll find MECs an excellent addition to your super squad - I often ran with two in my six-man team.